No, they are not ducks. So what is that, you ask? 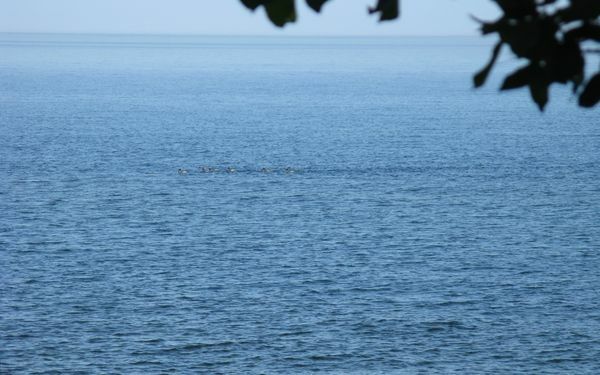 I'll give you a hint: it's a flock of birds on Lake Superior in August. That is a flock of… loons. Loons do not flock. Loons are territorial in the extreme. They are completely family-focused. Unless a lake is pretty good-sized, say larger than 500 acres, a pair of loons will take it over and drive off any other loons — or geese or ducks — that are looking for a nice little cottage with picket fence and a place for the kids to play. They will permit their own little feathered progeny hang around the home lake for their first summer but probably no longer. "Look, guys, a mini shark fin! Oh, wait, that's just Virgil practicing the backstroke. with your shenanigans. Honestly, the young 'uns these days…"
Loons do, however, migrate. And according to Teh Google, they often form groups, aka, "flocks", to make the long journey south. And that is what we have here. This site tracks the migrations of loons from two groups, one that nests in central Minnesota, and the other that nests in north central Wisconsin just south of Lake Superior. Certain of the birds have radio transmitters that enable the tracking. This entry was posted in Animals, North Shore. Bookmark the permalink. 0 Responses to No, they are not ducks. Wow. That is cool… and I learned something new! Pretty cool to see them all in a group like that! How very cool! I can’t recall if I’ve actually seen a loon (being in Virginia and all that). However, when I running on Bald Mountain Rd. one days last spring, I could have sworn that I heard something that sounded suspiciously loon-like (maybe the tremolo?). But the bird in question appeared to be in the woods and was probably about 5 miles from the Potomac River. Whatever it was, it was very enchanting. I have seen loons in the winter, down here on our lake in Missouri, as well as on the Gulf Coast and in Kentucky. According to the experts, they don’t call except when they are up north, but I think I heard one once during the late winter here. Experts don’t know everything. I think it is telling that the Minnesota State Bird heads south for the winter. Are you sure they’re not ducks?